Well, it’s almost February. 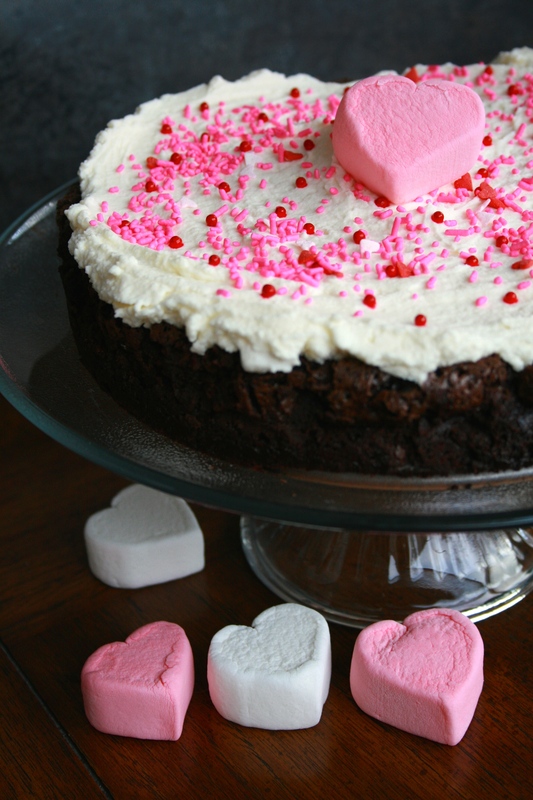 So it’s almost Valentine’s Day which means I have an excuse to decorate this cake in pink and marshmallows and sprinkles. Underneath all the glitz this cake happens to be very, very dark and chocolatey with the warm heat of cinnamon and cayenne pepper. The spicy ganache and the mascarpone cream perfectly complement the cake. Preheat the oven to 300F. Grease a 9″ round springform pan and line it with parchment paper. Dust with cocoa powder. Melt the chocolate and butter in a medium metal bowl set in a skillet of simmering water, stirring until smooth. Remove bowl from heat and let cool slightly. Combine the eggs, sugar, vanilla, salt, and water. Beat on medium-high speed until the mixture is very foamy, pale in color, and doubled in volume, about 2 minutes. Gradually pour in the chocolate mixture. Increase the speed to medium high and continue beating until well blended, about 30 seconds. Add the cocoa powder and mix on medium low just until blended, about 30 seconds. Pour the batter into the prepared pan. Bake until a pick inserted in the center comes out looking wet with small gooey clumps, about 40 minutes. Don’t overcook. Let cool in the pan on a rack for 30 min. If necessary, gently push the edges down with your fingertips until the layer is even. Run a small knife around the edge of the pan to loosen the cake. Cover the cake pan with a wire rack and invert. Remove the pan and parchment and let the cake cool completely. The cake may look cinched in around its sides, which is fine. Transfer to a cake plate. Cover and refrigerate the cake until it’s very cold, at least overnight. Put chopped chocolate into a medium bowl. In a saucepan bring the cream and spices to a simmer then pour over the chocolate. Let stand for a minute before whisking until smooth. Beat all ingredients together on medium-high speed until thick but fluffy. 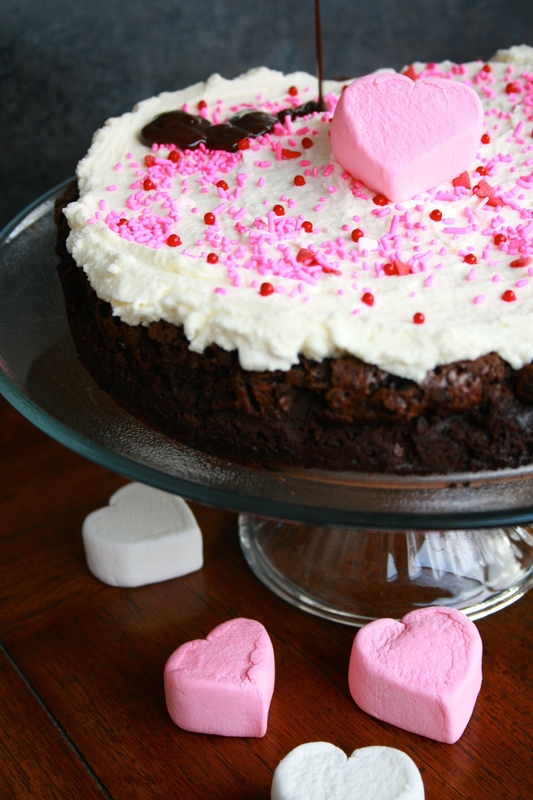 I’m making this cake this weekend. I’ll let you know how much we love it! Yum! I love a bit of spice with my chocolate.